I have been putting off posting about this front-page New York Times story. In part I've delayed because I needed to check some of its facts with colleagues; in part because I and others have been pushing the story to contacts in the US government asking them to do something (and Iraqi colleagues have been mobilizing to do the same for their government); in part because I try to make it a principle to not write when too angry to think straight. The gist of the story is that the Iraqi antiquities police force is a miserable failure. 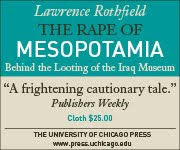 The article focuses on the failure of the Iraqis to fund the force. But the key point is that this new force was not established until 2008 — that is, after years of unsuccessful efforts by Iraqi cultural heritage officials — in particular, Donny George Youkhanna -- to build policing capacity with almost no assistance from the US. From 2004 on, Youkhanna struggled to create a 1,400-strong antiquities police, which might have done quite a bit of good had the US provided some help even if only in the way of things like gas, trucks, walkie-talkies, etc., but Youkhanna's force was starved budgetarily until it was shut down. Of course, under Bush this was hardly surprising, given that the US military itself did almost nothing to address the problem of massive looting of archaeological sites during the occupation period. Many of us had hoped that with a change in administrations, attention would now be paid, at long last to beefing up Iraq's capacity to police its sites. But the Obama administration does not look much different than the Bush administration on this issue. As reported repeatedly on this blog, it has failed to train or fund or provide logistical support for Iraqi antiquities police: the military has done next to nothing, as the article makes clear enough, and the State Department, which has money to spend on Iraqi cultural heritage, refuses to spend more than a smidgeon of it on security issues. In short, where stopping the looting of Iraq's archaeological heritage is concerned, to paraphrase Obama, we seem to be as careless getting out as we were careless getting in.